The Bloomberg consensus estimate for new homes sales was an overly-optimistic 518,000. Instead, it's bad news again as new home sales fell a very steep 11.4 percent to a 481,000 annual rate. Median price fell 1.5% to $277,400. Year-on-year, the median price is down 1.7%. Today's report echoes last week's housing starts & permits data and points to stubborn weakness in the new homes market. The Northeast contributes the least. The South contributes the most followed by the West so weather is not a significant factor. 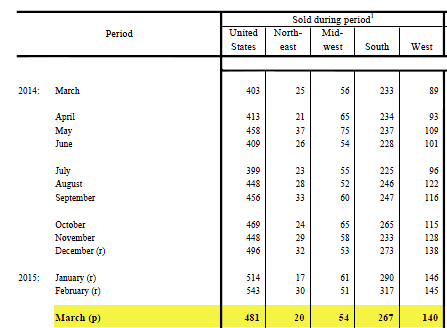 Above New Home Sales table from Census.Gov. Everyone seems to expect a return to the bubble years even though it's pretty clear where the range really belongs. 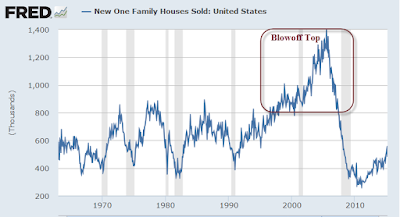 Demographically speaking, as boomers age, their houses will add to existing supply as they downsize, then pass away.